BIG CYPRESS — Phyllis Cofrancesco received her first Seminole doll in the early 1950s when she was a young girl living in Connecticut. Her parents gave her the doll as a South Florida vacation souvenir. “I had never seen a doll made of tree bark. The clothing on the doll was much different than my ’50s clothing. It was a colorful cotton frock, and it had a creative design on it,” she wrote in a recent letter, more than 50 years and 68 Seminole dolls later. Cofrancesco’s dolls, perched for decades in a cabinet in her home, are now “back home where they truly belong” at Ah-Tah-Thi-Ki Museum on the Big Cypress Reservation. “I wanted to pass (the collection) on in its entirety to a place where it would be enjoyed and preserved for generations to come,” Cofrancesco said. Ah-Tah-Thi-Ki collections manager Tara Backhouse said the Cofrancesco doll collection is the largest acquired by the Museum since doors opened to the public in 1997. 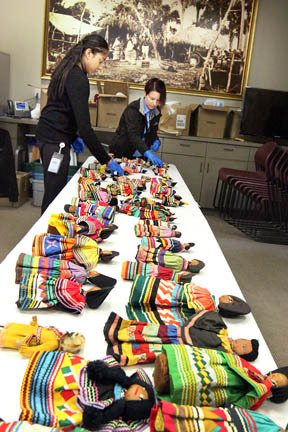 The acquisition brought the Museum’s Seminole doll inventory to 257. Cofrancesco took such good care of the pieces that each had been numbered and photographed prior to the purchase in October. Quickly, they were bagged individually, placed in isolation, and quarantined to ensure decontamination of possible bugs or mold. But first, the purchase of the dolls was approved by the Museum’s nine-member acquisition committee, Tribal cultural advisers and interested community members. Backhouse said Willie Johns and Pedro Zepeda, both former outreach specialists at the Museum, played significant roles in the decision to make the purchase. “Many people in the Tribe want to see artifacts and crafts come back home,” Backhouse said. Several of the dolls were returned with original tags that provided clues to time periods in which they were fashioned or purchased. A handful of tags were from the Indian Arts and Crafts Board of the 1940s. Others were signed and dated by the crafters who included Sally John, Mary K. Billie and Minnie Doctor. One doll, circa the 1978 Florida state elections, featured a campaign tag for then Rep. Gene Campbell (D-West Palm Beach): Don’t Gamble – Vote for Florida’s Campbell. Campbell was, in fact, a leading proponent for the legalization of casino gambling. Cloth patterns, threads and beads further date the dolls, Backhouse said, but formal archaeological reports will take months to complete. Each doll will be described in great detail and each condition will be thoroughly accessed. Conservation treatments will be applied as needed to ensure no further disintegration of components. Finally, each doll will be measured, photographed and then wrapped in acid-free tissue, placed in an acid-free box and stored in the Museum vault. Backhouse said exhibits are planned up to three years in advance, but no plans have been made yet to display the dolls. “We will have to look at what kind of story provides the best way to show the dolls and then the dolls would be integrated into that story. Selections could go out one or more at a time,” Backhouse said. For Cofrancesco, her first Seminole doll will always be the most special. She was smitten by the beautifully colored patchwork dress, the many layers of beads around its neck and what she thought was a black hat on its head but later discovered was the board hairstyle unique to Seminole women. She also learned that the doll figures were made of palmetto husks, not tree bark. In 1972, when Cofrancesco moved with her husband and children to South Florida, she began to collect the dolls in earnest at flea markets and house sales while learning more about Seminole culture. Soon, she began attending pow-wows and other events at tourist attractions in Miami, Hollywood and the Miccosukee community in Trail. In the 1980s, her collection had blossomed to include a pink-hatted male doll purchased at an estate sale in Delray Beach and an Osceola doll, made of porcelain bisque, that she found at the Eastern States Doll Show in West Springfield, Massachusetts. “Though not made in the traditional Seminole way, I was honored to make this heroic leader a member of the growing Seminole family of dolls,” Cofrancesco said. On a recent day, when the entire collection was released from quarantine and placed on a table to view, the dolls resembled a family of generations as old as the 1920s and as young as 2001. “I am proud to say they are now back home where they truly belong,” Cofrancesco said.